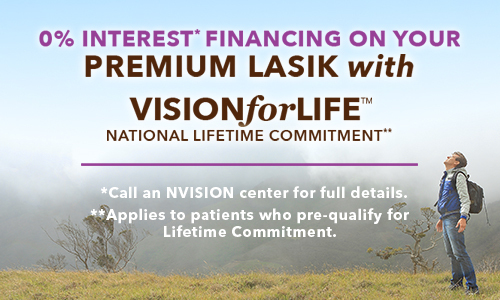 NVISION offers its LASIK patients a free VISION for Llfe™ Lifetime Commitment. Simply, you will have the confidence that your vision results post-procedure will be long-lasting. VISION for Life is NVISION’s commitment to you that they stand behind your LASIK vision correction results for life. The primary benefit of the VISION for Life program is their assurance that if an enhancement is medically necessary, eligible and participating patients are entitled to the surgical enhancement laser surgery procedure with any VISION for Life surgeon nationwide, at no charge. Learn more here.